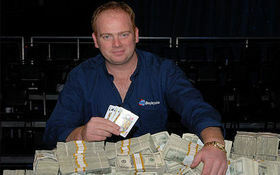 Yet another World Series of Poker bracelet is up for sale, but this time the owner is going to forego the spectacle of auctioning off his small piece of poker history on EBay, instead Irish poker pro Marty Smyth wrote on his Card Player Europe blog that he would be willing to part with his 2008 WSOP Pot Limit Omaha World Championship bracelet for the sum of $10,000 (or maybe £10,000 since he wasn’t overly specific and did use the word quid earlier in the post). “I’m very proud that I also won a WSOP event and the title means a lot to me. Anyone interested in buying Smyth’s bracelet can contact him via Card Player Europe or Boyle Poker where he is a sponsored pro. This entry was posted on Wednesday, January 5th, 2011 at 7:36 am and is filed under Poker News. You can follow any responses to this entry through the RSS 2.0 feed. You can leave a response, or trackback from your own site.